Dylan Thomas (27 October 1914 – 9 November 1953) was a Welsh poet and writer whose works include the poems, “Do not go gentle into that good night”, “And death shall have no dominion”. He also wrote plays such as, Under Milk Wood. 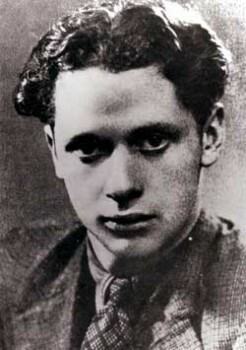 Dylan Thomas was born in Wales in 1914. He was a neurotic, sickly child who shied away from school and preferred reading on his own; he read all of D. H. Lawrence’s poetry, impressed by Lawrence’s descriptions of a vivid natural world. Fascinated by language, he excelled in English and reading, but neglected other subjects and dropped out of school at sixteen. His first book, Eighteen Poems, was published to great acclaim when he was twenty. Thomas did not sympathize with T. S. Eliot and W. H. Auden’s thematic concerns with social and intellectual issues, and his writing, with its intense lyricism and highly charged emotion, has more in common with the Romantic tradition. Thomas first visited America in January 1950, at the age of thirty-five. His reading tours of the United States, which did much to popularize the poetry reading as new medium for the art, are famous and notorious, for Thomas was the archetypal Romantic poet of the popular American imagination: he was flamboyantly theatrical, a heavy drinker, engaged in roaring disputes in public, and read his work aloud with tremendous depth of feeling. He became a legendary figure, both for his work and the boisterousness of his life. Tragically, he died from alcoholism at the age of 39 after a particularly long drinking bout in New York City in 1953.